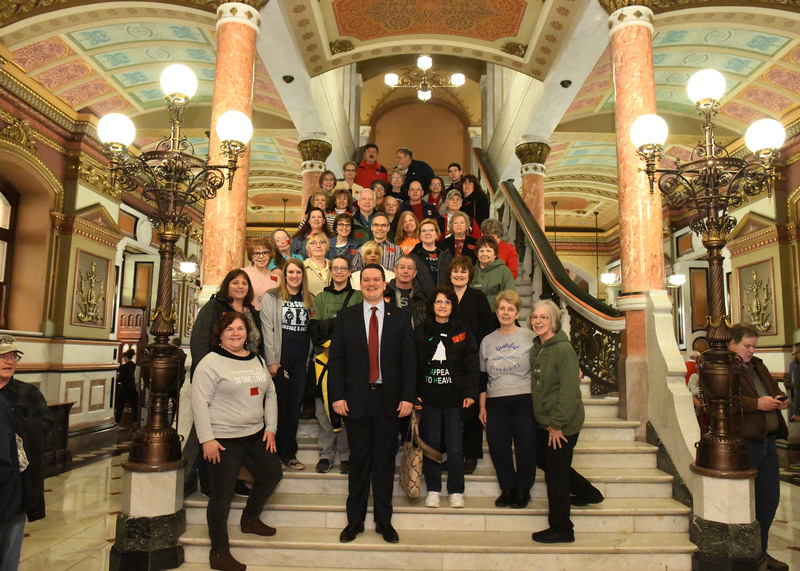 State Representative Andrew Chesney co-sponsored a chartered bus trip of over 50 Northwest Illinois pro-life advocates as they joined statewide groups in converging in the Illinois State Capitol on Wednesday to advocate for lives of the unborn and against the expansion of abortion and infanticide in Illinois. “If we don’t stand for life, not much else that we stand for or fight for here in Springfield matters. I am proud to be pro-life and am honored to join these passionate advocates in attempting to restore a culture of life in Illinois,” Rep. Chesney went on to say. Rep. Chesney was contacted by local pro-life advocates who hoped to visit Springfield as part of a day-long Rally for Life in the State Capitol. When he learned of the effort, he offered to co-sponsor the bus trip (which he funded privately, with no taxpayer funds utilized) and to greet the pro-life advocates in Springfield during their visit. · This legislation if enacted eliminates restrictions on post-viability abortions, allowing abortions at any stage of pregnancy. · If enacted under The Reproductive Health Care Act, a fertilized egg, embryo, or fetus will NOT have independent rights under the laws of this State. · The Parental Notification Act of 1995 was not enforced until 2013. The Act was challenged in court and in 2013 the Illinois Supreme Court ruled that the Parental Notice of AbortionAct did not violate the Illinois Constitution. This is still the current law. · Illinois law mandates the notification of a parent, grandparent or legal guardian when a minor seeks an abortion. Current law also provides a process for a minor to go to court to get a waiver of notice from the court. · If enacted, this legislation would remove the parental notification requirement for a girl 17 years of age or younger to notify her parent or legal guardian before obtaining an abortion.